A Palestinian Authority tycoon talked peace with Israeli supermarket mogul Rami Levy in one of his Yesha outlets, angering boycotters. A Palestinian Authority tycoon talked peace with Israeli supermarket mogul Rami Levy in one of his outlets in Judea and Samaria, angering the boycott movement. 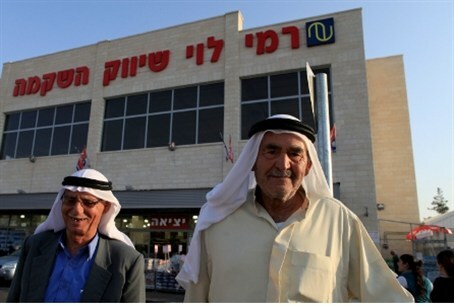 Arab billionaire Munib Al-Masri met with Levy, who has backed nationalist causes and has promoted Arab-Jewish co-existence by hiring workers from both sectors in his supermarkets, several of which are located in Judea and Samaria. The newest store, located in Gush Etzion, is filled with Jewish and Arab shoppers, especially on Thursday, the day before the Muslim day of rest and the eve of Jewish Sabbath. Al-Musri’s talks with Levy over the Saudi Arabia 2002 Peace Plan infuriated the Boycott National Committee because of the location of the meeting. The Boycott movement calls for a total ban on products made in Judea and Samaria and on conducting meetings with Jews in the area. Al-Masri met with Levy in order to drum up Israeli support for the Peace Initiative, which demands Israel’s forfeiting all land restored to the country in the Six-Day War in 1967 and calls for flooding the Jewish state with millions of foreign Arabs claiming Israel as home. The “peace process” is considered to be dead and buried by virtually all parties except Western leaders, particularly those in the European Union and the United States. PA Chairman Mahmoud Abbas two years ago ended years of PA-Israeli talks that won hundreds of concessions by Israel but failed to grant him all of the demands under the 2002 Peace initiative. He has forfeited talks by appealing to the United Nations for recognition of the Palestinian Authority as a new Arab state and erasing Israel’s borders. His bid to the UN failed last year, but he has said he will try again after the General Assembly returns from its summer recess next month. He has indicated he might settle for non-member status, which does not need approval of the United Nations Security Council, where it is doubtful if he can get the needed two-thirds approval for the PA becoming a full member of the international body.